I wouldn’t have the time to write this review before as I had been pushing my effort as hard as I was before ViralTag. Now ViralTag leads me to have a more balanced lifestyle, away from the computer, back in my creative charging zones. 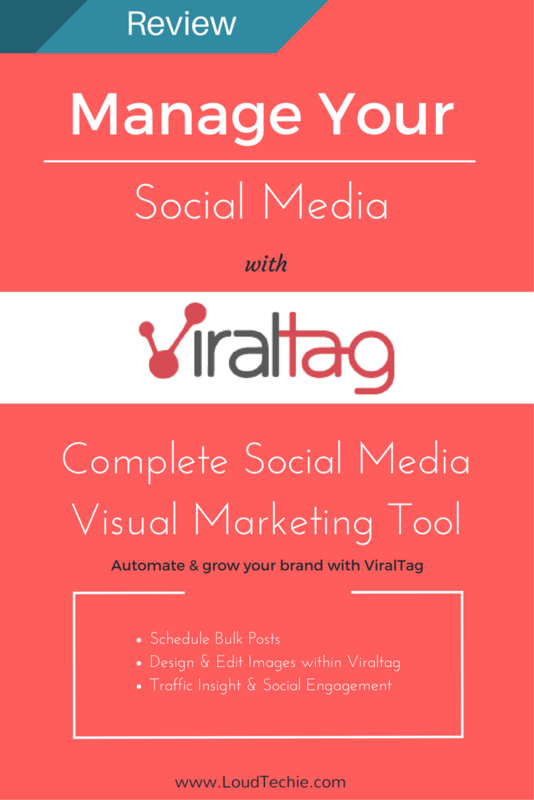 ViralTag is a perfect social media visual marketing tool for scheduling your visual content. So, I have decided to share my experience here! In this post, I am going to share my experience about ViralTag! I will demonstrate you how useful ViralTag can be for scheduling & Posting your visual social media content especially for Pinterest. When I first heard about this social media tool I thought to myself, hmm…it might seem like something I could just do manually myself. But ViralTag is really astonishing….. Yeah….ViralTag is one of the best tools for posting and sharing visual contents to both Instagram and Pinterest. ViralTag is a popular social media visual marketing tool that can be used for scheduling of visual posts to be shared across major social networking sites such as Pinterest and Facebook. Within only a few years of its launch, ViralTag has gained big popularity because of its easy scheduling and a wide range of social media marketing options. You may have come across or even used many social posts scheduling programs, but this one allows you to schedule image-focused posts for visual social media websites like Pinterest, Instagram, and Facebook. So, if your business or marketing involves sharing a lot of images on social media, this is just the tool you need to save time and energy. I started using ViralTag a few months ago and was really impressed by the results I achieved so far! What we have experienced is a steady flow of traffic to our blog 24/7. The best part is, that I can be able to manage my major social accounts (Facebook, Twitter, Pinterest, Instagram, LinkedIn, and Tumblr) and create social media editorial calendar using the platform all at once. And one thing I was greatly enthralled is “Ease of Use”. I have tried many different options to ease my task of scheduling and posting social media contents but ViralTag is at the top of my list for the ease of use. ViralTag comes with a free Chrome extension that you can install in a second. I personally love using Pinterest to follow up with my followers but sometimes it seems a little bit difficult due to my hectic schedule. But now with the use of ViralTag, I am able to schedule my pins out at the times that are convenient to my readers. Once you signed up into ViralTag using the login credentials, you’ll be invited to add your social media accounts where all the social media accounts are enlisted. Here I have added my Pinterest account and then clicked on the “Connect” button. Once you click on the connect button, you’ll be asked for the permission for ViralTag to access your social media site accounts. 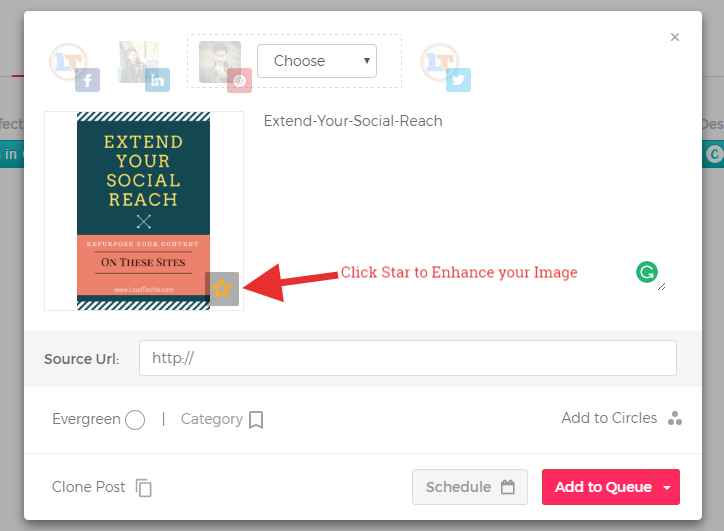 Now you can start scheduling and posting your social media content. You can upload the images from Facebook, Dropbox or search for new images from Google, Flickr, and Instagram and so on…. When you schedule a post, it will appear in the dashboard as below. It is very easy to add and schedule a photo-based post in ViralTag to be shared across as many social platforms as you want. Follow the step-by-step process below to schedule your first social media post now. ViralTag gives you a number of options to add media and content for creating a post. Step 1: Click the “Create a Post” button on the dashboard. Step 2: Steps to schedule a post in ViralTag. Select the social networking sites where you would like to share this post. 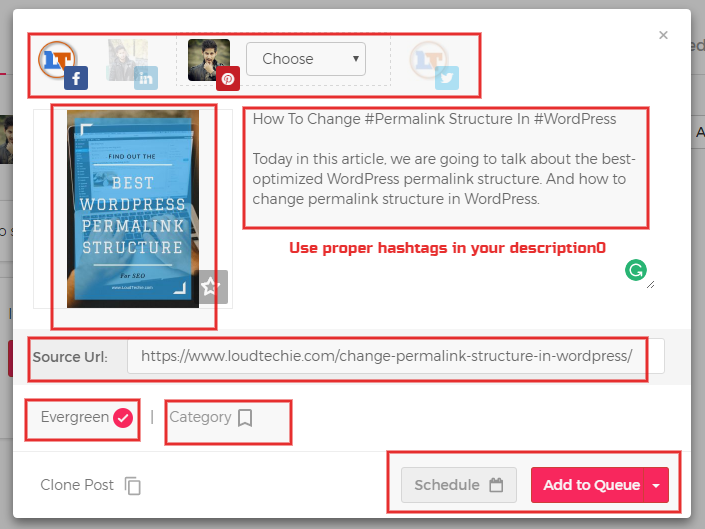 Write a text post with proper hashtags in the description field. Add a source URL (target page URL) if any. Select a category; Select Evergreen icon if you want to use the post in the future. Step 3: Now, click on Schedule button to schedule the post. Enter a date and time when you want your post to go live on your selected social networks. You can schedule one posts multiple times if you want by selecting "evergreen" option. And then click Add to Queue button. You can also choose to Post now or Save as Draft from the options provided. As you can see while scheduling a post, there is a button to “Clone Post”. 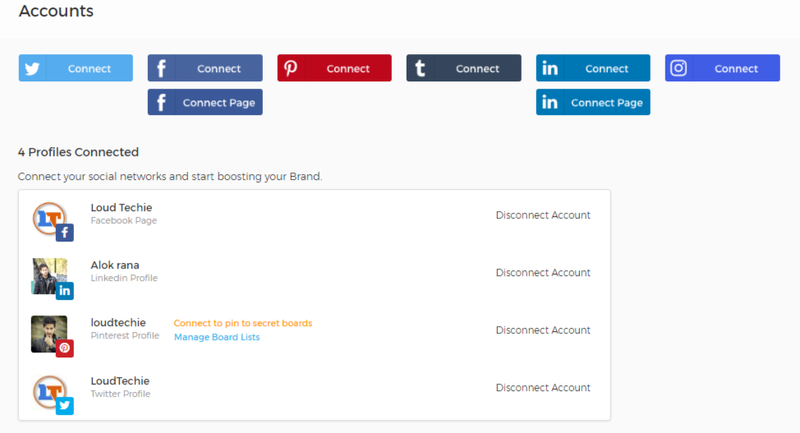 This feature of ViralTag allows you to create two or more similar updates for different social sites. You can customize and schedule each update separately. Find out visual details about it in image below. You can check your scheduled posts by clicking the “Posting Schedule” tab from the dashboard. It will show a editable calendar with all your scheduled posts for a month. It's always better to use "Get Recommended Times" option you can find just above your calendar. ViralTag also allows you to add editors and contributors to the same account. Contributors can add new posts or edit an existing one, and these updates can be approved or rejected by an editor. From the above description and steps, you can think of ViralTag as any other social media scheduling platform. But the thing that makes it unique and different is its virtual marketing feature. ViralTag allows you to post or upload images from a number of sources so that you can easily attach viral images to your posts. 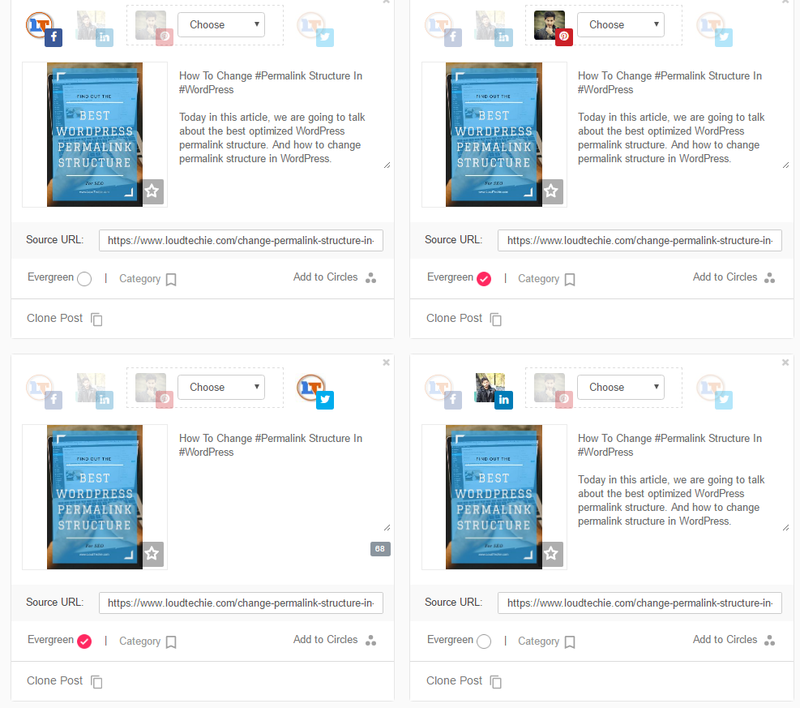 There are basically five ways to add images for scheduling in ViralTag. Method 2: ViralTag also supports bulk image uploading. You can select and add multiple images at the same time, and then choose while scheduling. Method 3: ViralTag is also available in the form of Chrome browser extension and a browser bookmarklet that allows you to add images from any web page and use them to schedule posts. The step-by-step process of installing and using the browser extension is explained ahead. Method 4: You can alternatively add images from the ViralTag Content tab where new images are added regularly. Method 5: ViralTag also has an image database divided into categories where they update many popular images for users. To install and use ViralTag browser extension, follow the steps below. Step 1: Open Chrome browser on your computer. Step 2: Go to Chrome web store and search for ViralTag extension. Install and activate the same. Step 3: You should see the Viraltag icon in the toolbar. Now, open the web page from where you want to add images. Step 4: You can see a little “Schedule” icon at the bottom right of each image on the page. Click on this button to schedule that image. Step 5: Follow the remaining steps as above to schedule a new post. Note: You can also go to your ViralTag account Settings » Extensions. ViralTag also features an inbuilt image editor called "Enhance Image" that lets you easily make desired changes in your uploaded images. It offers a number of image editing options including crop, effects, text, brightness, sharpness, focus, and much more. Click the Apply button after making changes you want. Step 1: Upload an Image using scheduling screen. You will see a star icon "Enhance Image" at the right bottom of your uploaded image. Step 2: Now you will be inside its editing window. There will be different "cropping" options available for your image. Now you can crop your image with custom size, optimized image size for Instagram, Pinterest, Facebook, Twitter and many more image ratios. Step 3: After cropping your image you will get a collection of tools in a single window to enhance your image. You must be thinking it has too many options for an in-built image editor tool, but this is just one of its feature what makes it a perfect social media VISUAL marketing tool. 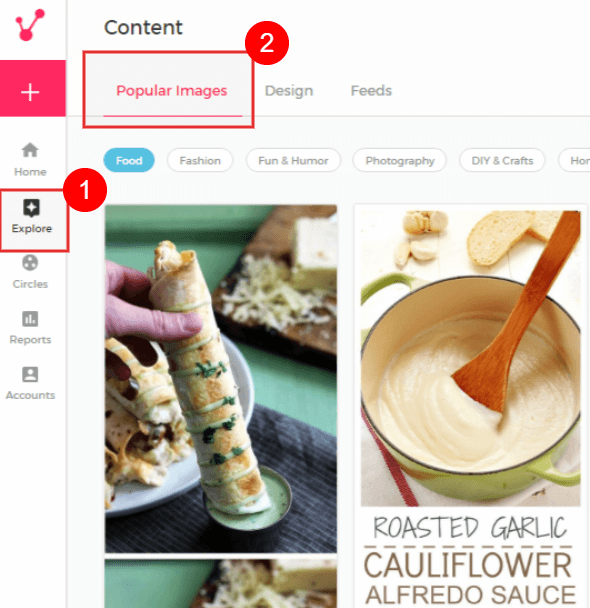 You can create your own visual content design inside ViralTag dashboard. Under your ViralTag account Settings » Content » Design. Recently ViralTag has integrated with Canva one of the most easy to use and best social media visual content designer tool which can create almost all types of social media visuals without any professional designing knowledge. It has very easy user interface that you can create any social media visual content within 5-10 mins. I am myself a big fan of Canva Tool. You can even improve the functionality of ViralTag by enabling the useful integrations from the “Integrations” tab. Some popular options include Bitly, Google Analytics, and UTM tracking. By connecting these integration tools, you can leverage the benefits of these third-party tools within your ViralTag account for better visual social media marketing. For example, you can keep track of the actual real-time performances of your schedule posts by integrating with Google Analytics. If you’re already using Google Analytics, you must know that it is the best tool to analyze the performance of any marketing campaigns. ViralTag also has inbuilt reporting option where you can keep track of your social media traffic. It shows the overview of the traffic generated by your scheduled posts. It also recommends the best time to post, based on the performance of your existing campaigns. Here I am using my 4 different Social network accounts! As you may have noticed in the below screenshot. 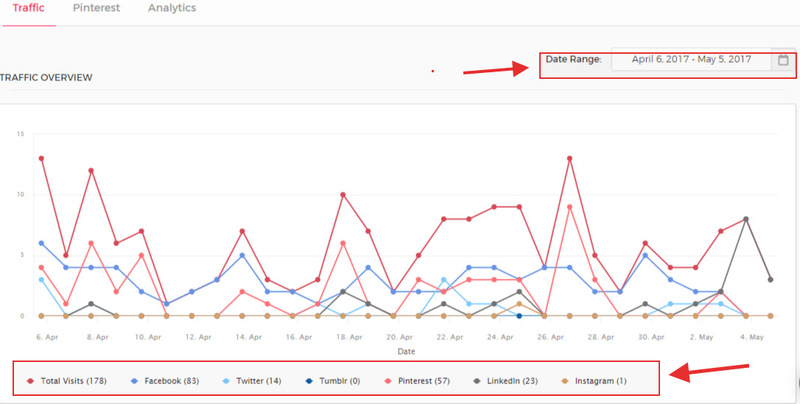 Apart from ease of scheduling and posting, ViralTag also helps to monitor the performance of the content you posted. Integrated with Google Analytics, ViralTag also has an inbuilt Analytics that lets you monitor the posts you made on various social networks. One more thing I like about ViralTag reporting section. They have also advanced their Pinterest report section in past years. 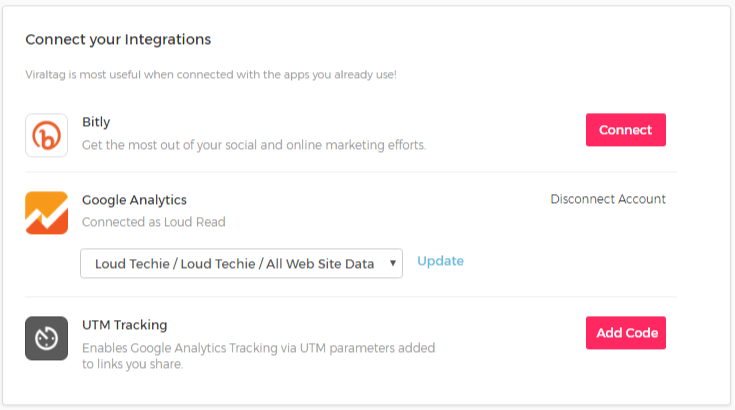 Now you can view all required analytics about your particular Pinterest account. There will be a detailed summary about your Pinterest account for which you can select your prefer date range. Other then this you can check your Pinterest account engagement report, followers growth, most engaging Pins and most engaging boards. If Pinterest report is not enough for you, try their Analytic option just next to Pinterest report. You can find reports of all your connected social media accounts such as; Twitter, Facebook, Pinterest. The report format will be divided into three section report which includes Engagement, Followers and Best times. Also, ViralTag never disappoints me when it comes to pricing and plans. First of all, I just signed up for a free ?14 day trial of ViralTag to test it out whether it works out or not. Compare to other tools available for the same purpose, ViralTag offers quite impressive plans which comes under budget for an Individual. After 14 days trail period expired I asked them to extend my trail period and without any questions they extended it for 1 more week and just to get to know more about ViralTag I asked them to extended this tool for more than twice I think. As I liked its features, I wish to continue the service and thinking of to become a member by paying $29/mo. 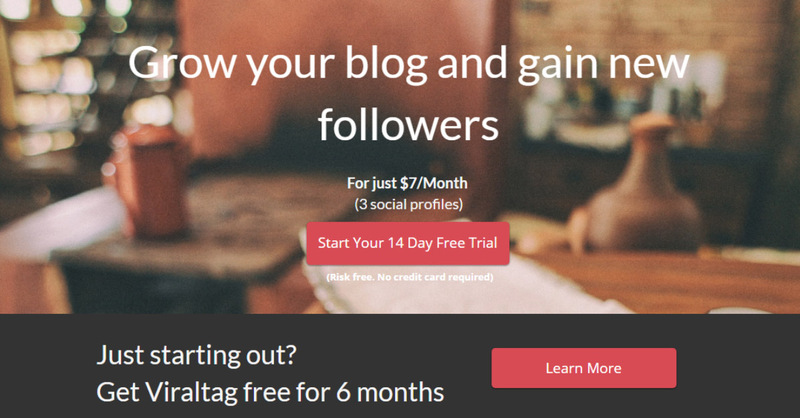 Since am a blogger, ViralTag offers free 6-month membership! To get this free membership, all I had done was published an honest review of ViralTag on my blog. Wow… amazing’na? ViralTag comes with many exciting offers. 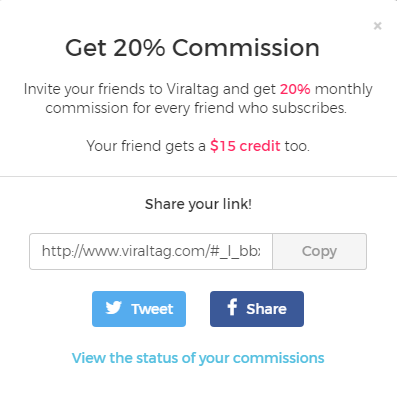 I would like to share some attractive offers by ViralTag. 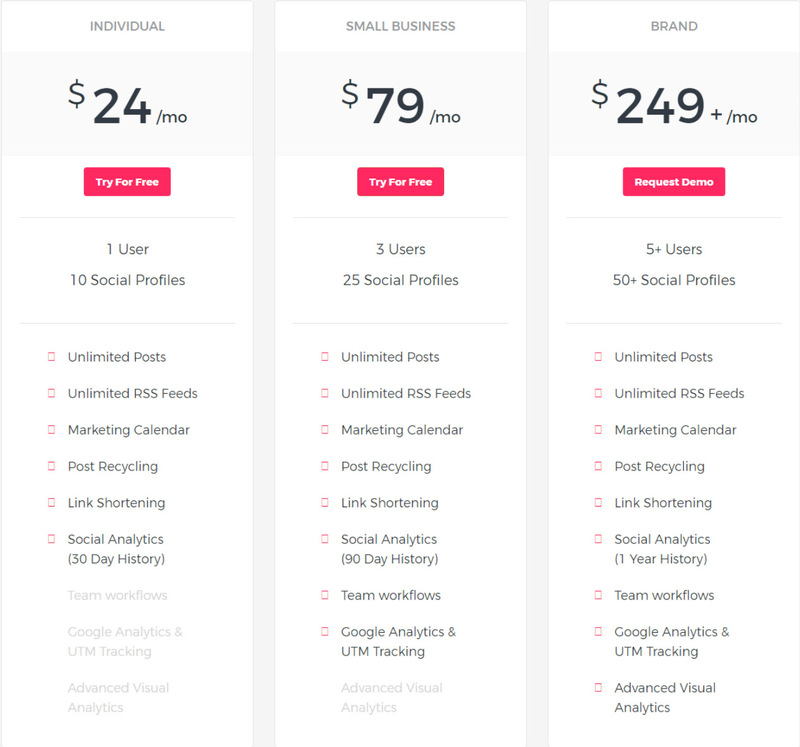 #1- Offer - 6 Months FREE Blogger Plan: If you are a blogger who you want to use ViralTag, you can get ViralTag FREE for 6 months. Yes! everyone like to get reviewed by bloggers but ViralTag has better offer for your review post. To get ViralTag FREE for 6 months all you need to do is write a review post about ViralTag on your blog. After your 6 months Free plan, blogger plan will cost you $9.99/mo or $7 Billed Annually! #2- Offer - Get 20% Commission: They offer 20% monthly commission for each user who subscribed using your referral link. Not only you get benefited but the user who use your link will also get $15 free credit for joining. Isn't it Interesting? You should give it a Try too. If you use my above link button I will get 20% commission TIA for that and congrats for your $15 Free credit. In past few years they have improved their support performance. They are now providing live chat support for everyone (registered member or just visitor) I can simply chat with them from inside my dashboard and the maximum waiting duration I have encountered till now is around 10-20 mins. Visitors can talk to their support just by visiting their official site and a sidebar chat support pop-up will welcome you. Even, I like ViralTag, there are always few pros and cons to everything. I wish to mention it here, as those are worth mentioning. You can Manage your Pinterest board lists by grouping your board lists. Easy bulk uploading and bulk scheduling your posts. Multiple ways to upload an image for scheduling. Design using Canva visual content designer tool within your dashboard. 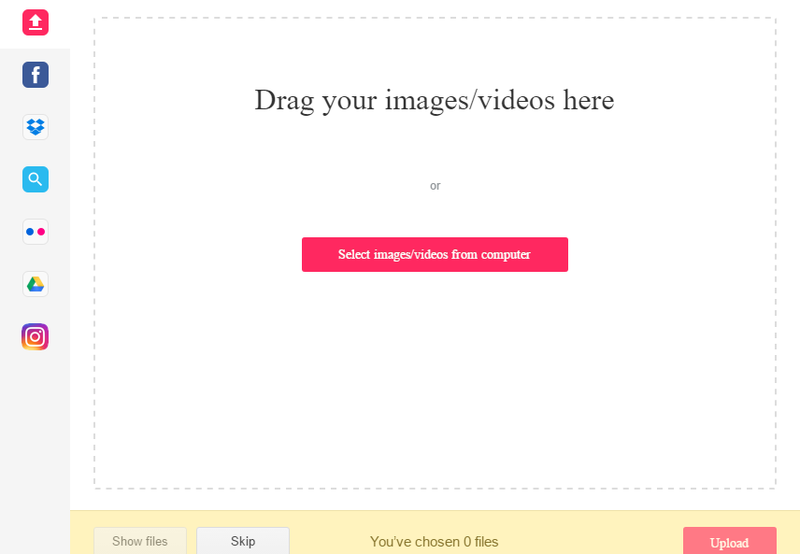 In-built image editor for all your uploads. Support with fast response time. Evergreen feature keeps on posting your old content time to time. ViralTag Free Extension is only available for Google Chrome and not available for Firefox. You cannot make pre-set weekly or weekday schedules on ViralTag. Very limited analytics, nothing more really than what you get from Pinterest Analytics itself. There is no option to shuffle scheduled content. At the end all I can say about ViralTag, it is the best solution for all kind of social media marketing. You should give it a try, you can use their 14 days FREE trial for the first time. Trust me you won't be disappointed by ViralTag. It will ease your all social media marketing tasks. Overall, I really love ViralTag and I think it’s a good option for bloggers who need to schedule frequent updates on social media. Strongly Recommended! Thanks for sharing.It is very useful for everyone.keep up the good work. Glad to have come across your post. I am not a technical person and don’t know much about these aspects but it’s great to add to my knowledge. Appreciate your feedback and you should give it a try once. If you are doing social media marketing. Hello Arra, you should try it once. You can use my affiliate link (https://www.loudtechie.com/go/ViralTag) with ViralTag and start using it by getting $15 free credit to start with. You should know how effective it can be just by using this scheduler tool. I don’t use Pinterest at all. But I am sure this information will help me a lot whenever I decide to use it. ViralTag does look simple to use or maybe it is because of the way how you explained it. Thank you. Good to see you again Jeenu. 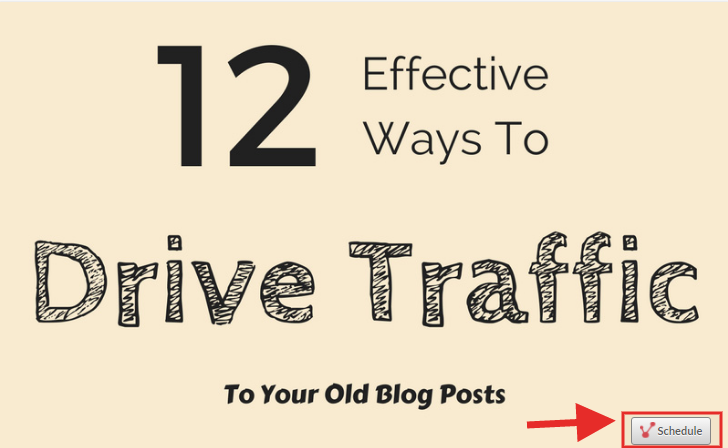 Pinterest is one powerful platform to drive traffic to your blog. And also to increase your social engagement. There so many blogs earning good income just by using Pinterest traffic. I pinned this! SUPER helpful. I am going to be looking into it for my blog. Thank you so much for sharing. I do wish it were a little more economically doable but glad they do a free trial. Sure you can use my promo links below to get some free credit while registering to ViralTag. Seems like a great tool for someone who wants to schedule their social media posts! Yes, it is a great one. If you haven’t tried it yet, you must try it once. Looks like a great tool to keep me organized. I have several blogs and it is a daunting task to keep track of the stats of each and every blog. I will look further into this. Thanks for the detailed description of what you can do with ViralTag. You are welcome. I have also shared some offers at the end of this article. It can be useful for you. This looks like a useful tool for scheduling social media. I am sure it works well with pinterest and instagram. I feel like theres so much tools that I can still be using! Sure it is one amazing tool you can use for your Pinterest and IG marketing. There is actually one more scheduling tool I recommend for Pinterest and IG marketing “Tailwind”. I have experienced working with Tailwind before and I find it very interesting. These days I am using Viraltag only. I hope you will like it too. Give it a try and you may also like to check out discounts and offer at the end of this article. Viral Tag sounds just like the scheduling platform that I need for my social posts. Will certainly look into it. It can do much more interesting things including scheduling posts. Must try it once.